[T/N: Please read before you proceed! Just a quick note to say, please credit us properly when you post these translations elsewhere, because they did take a very long time. Always remember to credit your sources!! And yes, I know the pictures aren’t HQ scans (I actually took them with my DSLR camera and resized them) but our job is to translate, not provide you with HQ scans. Also, please forgive me for any grammatical or spelling errors! I did proofread but some things may have slipped through. <The Celebrity> has prepared a special birthday present to commemorate TVXQ’s 10th anniversary. “What is it that you truly desire?” was the question we threw at them. 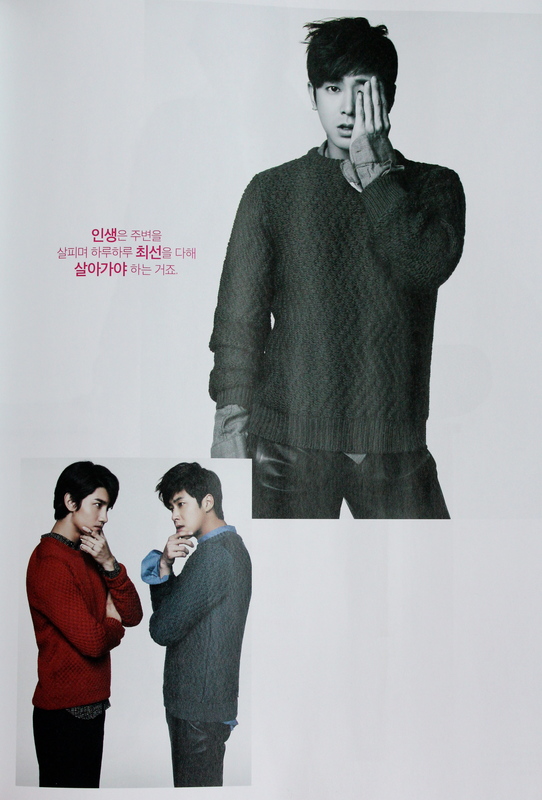 The stories that lay ahead are Jung Yunho and Shim Changmin’s answers to that question. U-Know Yunho and Max Changmin are TVXQ. In December of 2013, TVXQ will celebrate their 10th anniversary. Having spent most of their time together, everyone knows(U-Know) that the two people have worked hard to make TVXQ the greatest (MAX) group in the world. From the very start, they were celebrities. With every passing year, they have have undergone a transformation and evolved into mature celebrities who value the importance of being humble. Now, they are ‘real men’ who are considerate and watch over those around them. Because of this, <The Celebrity> has prepared a birthday present for TVXQ. ‘What is it that you truly desire?’ was the question we threw at them. The stories that lay ahead are Jung Yunho and Shim Changmin’s answers to that question. [All translations are from left to right for each category. 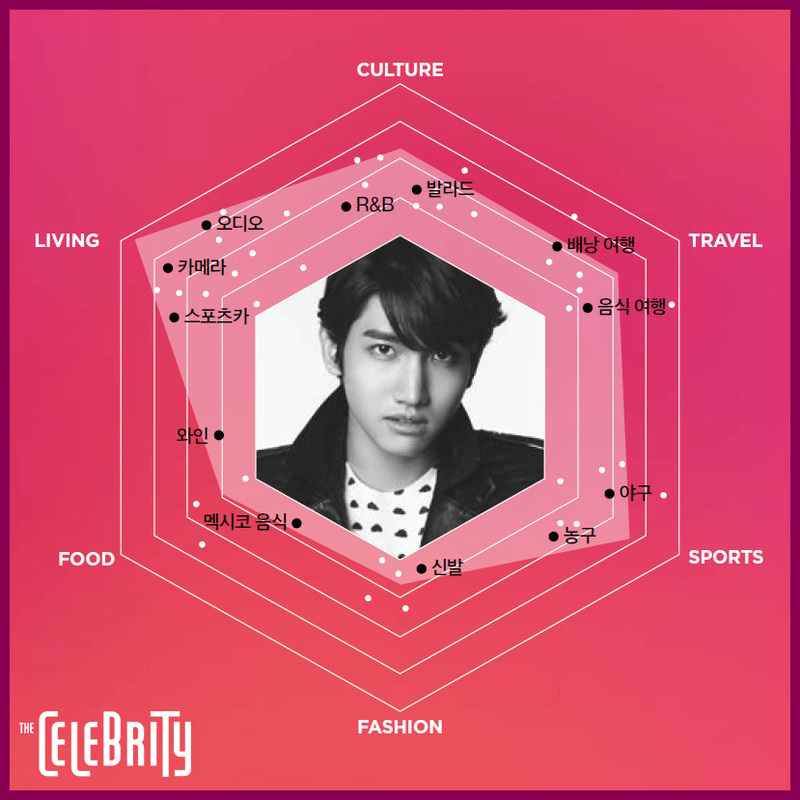 U-Know Yunho’s lifestyle preferences are most concentrated in the culture section. He is greatly interested in movies, concerts, and even po-art. 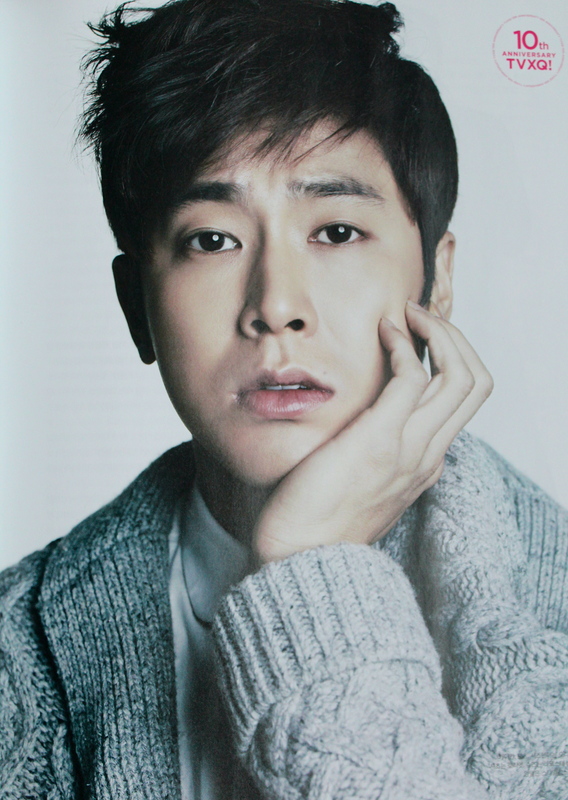 As a musician, U-Know Yunho’s musical taste is similar to that of TVXQ, favoring R&B, hip-hop and electronic. He is greatly interested in parties, likes Korean food, and enjoys snowboarding as his favorite Winter sport. So much that he feels sad that he can’t go snowboarding often because of his busy schedule. Setting aside the details of his personal preferences, one can see that most of the things he’d like to do in every field are various activities he can do ‘with a friend’. He said that he’d like to open a one-day cafe or bar and spend some time with his friends. Though this is something he already does, he has a great interest in volunteer work. He’s continuing down his road as an actor, and he dreams of appearing in movies and commercials in the future. When <The Celebrity> chose TVXQ as the celebrities of the month as they are celebrating their 10th anniversary, we asked U-Know Yunho what he wanted to and we could guess what his answer would be before he gave it to us. As expected, he chose ‘friends’ as his theme. He wanted to become a party host, who prepared everything himself, and create a meaningful and exciting night for friends he intends to keep for life. He did his best in the preparation process, reflecting his lifestyle preferences as much as he could. U-Know Yunho’s party became an amazing night that perfectly captured his preferences. If we look at the preference and propensity analysis sheet that Max Changmin created, we can see that he has a great interest in all things digital. The majority of his lifestyle is related to digital items, like cameras, cars and audio equipment. The second field of interest that holds his focus his sports. It must be because he’s currently appearing in the variety program <Our Neighborhood’s Master of Variety and Sports’, but he is greatly interested in a variety of sports like baseball, basketball and soccer. It’s impossible to leave out his personal cultural lifestyle as he has been enjoying the single life since moving out a year ago to live by himself. Watching movies and anime, and listening to ballads and R&B is what Max Changmin likes to do when he’s taking a break and resting up at home. As a twenty-six-year-old youth, he still has so many things he wants to do, like jumping in his car and going for a drive by himself, or going on an epicureanism trip. To commemorate TVXQ’s 10th anniversary, <The Celebrity> has decided to show aspects of Max Changmin’s lifestyle that haven’t been seen before. 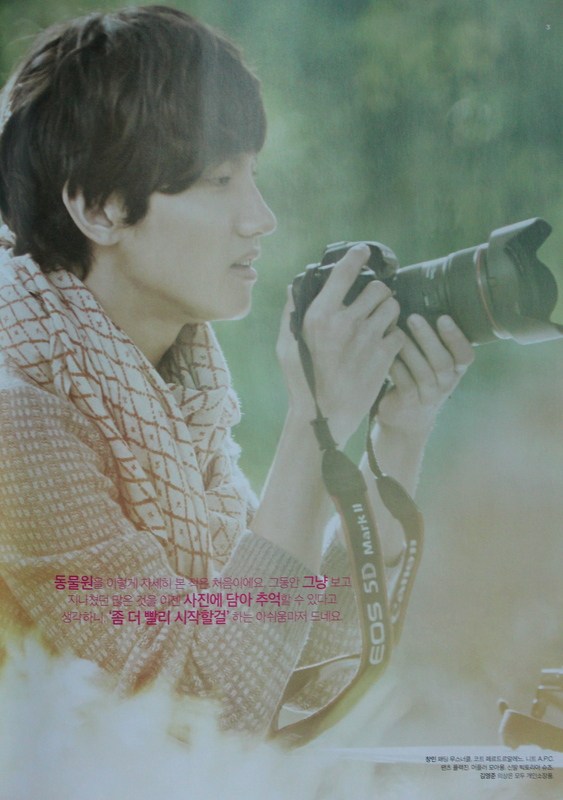 The lifestyle that Max Changmin wanted to highlight most in <The Celebrity> was his ‘aspiration to become a photographer’. As someone who enjoys taking photos as a hobby, it’s natural that he has fostered an interest in learning photography at a professional level. As a youth who wants to learn more about photography, not as TVXQ’s Max Changmin, his challenge began with Kim Young Jun, the famous Korean photographer, as his mentor. And three months later, Max Changmin has produced some beautiful photos in his first attempts as a photographer. 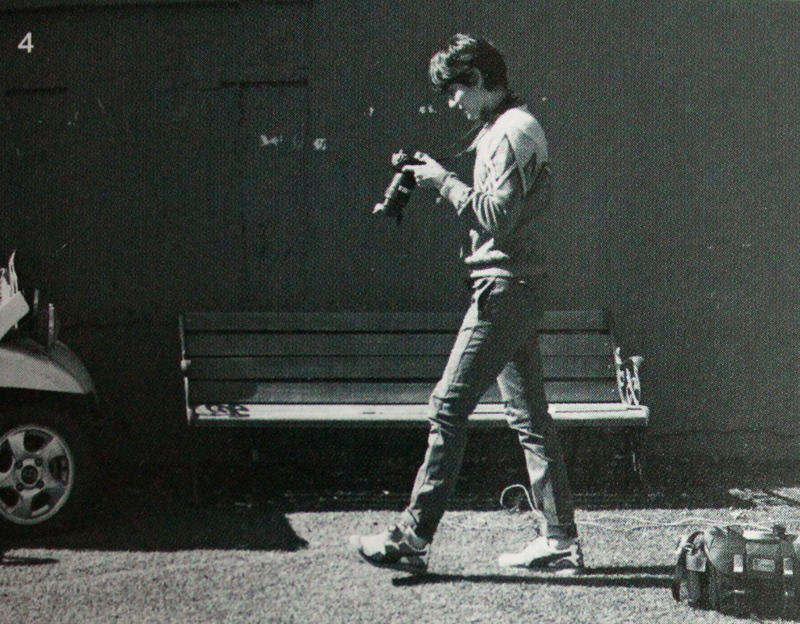 <The Celebrity> followed him along on his three-month journey to becoming a photographer. 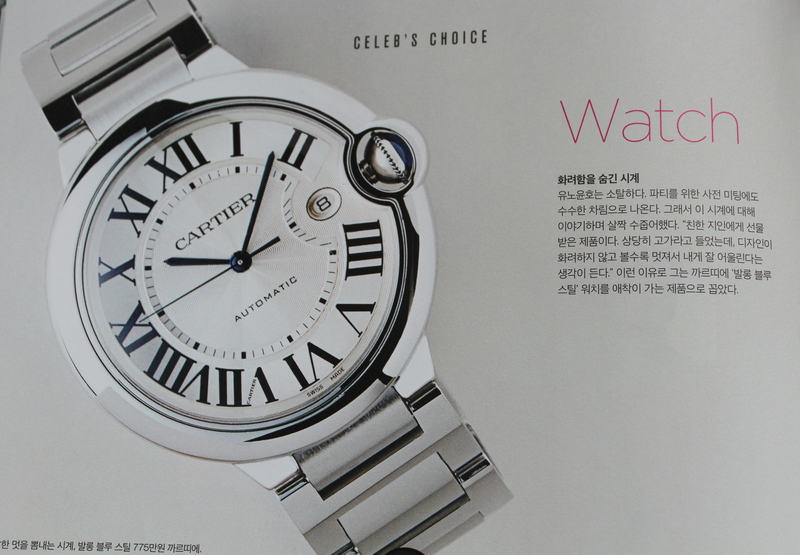 Watch: A watch that has a free and easy charm, Ballon blue steel Cartier watch. 7.55 million Won. U-Know Yunho is an easygoing individual. Even in the meeting that took place before his party, he came in modest attire. So he looked a little shy when he began talking about this watch. “It’s something I got from a close acquaintance. I heard that it’s quite an expensive piece, but I think it fits me well because it’s not too flashy, but looks greater the more you look at it.” Because of these reasons, he has chosen Cartier’s ‘Ballon blue steel’ watch as a product he is attached to. Michael Jackson was the idol of a young boy who danced with all his might at the Ssangam Park in Gwangju. The hopes of sharing a stage with the legend have disappeared, but this boy was able to stand on stage during a commemorative concert for Michael Jackson. “These shoes were meant to be worn by Michael Jackson during his ‘This is It’ tour, but it never happened. These treasured shoes ended up in my hands. I’ve never worn them before. They’ve been carefully placed in a display case in my house.” His affection for the shoes could easily be felt as he talked. How emotional must he have gotten when he received the shoes? Max Changmin first became interested in legos when he began living by himself. He was watching <Star Wars> by himself, and suddenly felt the desire to create a <Star Wars> atmosphere in his own space. 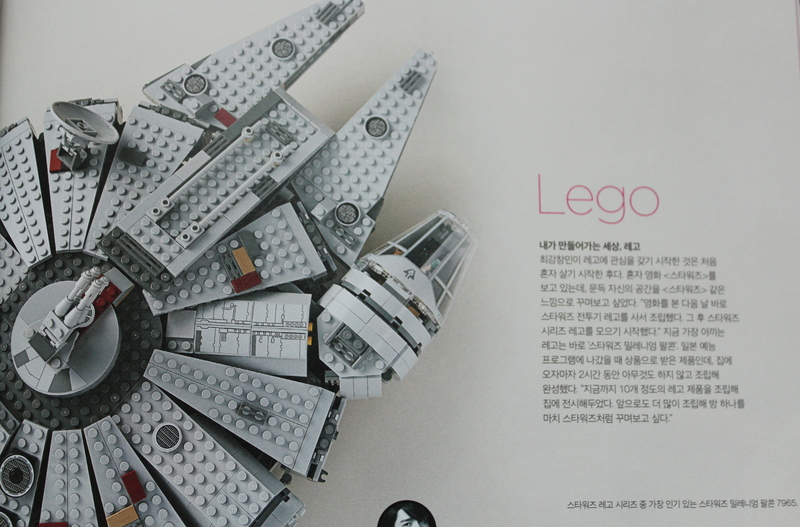 “The day after I watched the movie, I bought the lego pieces for a Star Wars fighter jet and put it together. That’s when I started building up my collection of the Star Wars lego series.” The model he values most is his ‘Star Wars Millennium Falcon’ model. He received it as a prize in a Japanese variety show, and he spent two hours doing nothing but putting it together as soon as he got home. “I have about ten lego models that I’ve put together and put up for display around my house. I want to collect more models and set aside a room at my place to create a Star Wars themed room. True friends are the kind of people you’re always glad to see, even if you haven’t met in a long time. U-Know Yunho has so many close friends by his side that it makes one quite jealous. Friends who he hung out with in Gwangju, friends he got to know while working, friends of friends who he became closer to than their mutual friend. U-Know Yunho has planned, prepared and proceeded over a party for his ’85st’ friends. He really did everything, from beginning to end! 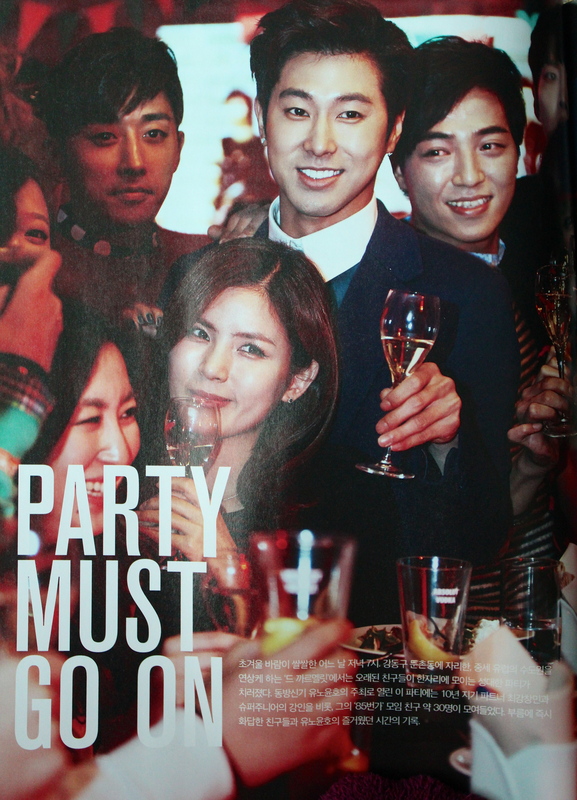 Though there were still two months left to go till the party, U-Know Yunho already looked excited. Becoming a host means being responsible for a lot of preparations. It may be a very tiring and hassling thing for some. But he rolled his sleeves up and got straight to work in order to create an unforgettable night for his loving friends. What kind of party? A prom party! We met with U-Know Yunho two months ago. From the start, he had expressed that he wanted to throw a fun party for his friends, and this meeting was to plan the specifics. A party with a great location, delicious food, uplifting drinks, and upbeat music. Talking about the purpose of the party, U-Know Yunho said, “I have a group of friends called the ’85st’. It used to be a group of friends for people who were born in 1985, but we’ve since gotten rid of the age limit and expanded the group to people in my hometown and friends I’ve met while working. I think it’s been about four years since all of us have met in one place.” It seems he was sad about the fact that the whole group hadn’t been able to get together in a while due to conflicting schedules, though they have met in smaller groups from time to time. He added, “In Hollywood teen movies, there’s always a ‘prom’ scene to celebrate the kids’ high school graduation. In <Back to the Future>, Michael J. Fox goes back to the 1950s and sees his mother at a graduation party. I’m certain that my friends will like this concept. Our own graduation party to celebrate 2013!” U-Know Yunho had made his final decision on the concept of the party he would hold for his ’85st’ friends. He even helped design the invitations that would be sent out, and we began planning a small gift for all the friends who would be attending the event. “There’s an entrance fee for this party. I’ll let my friends know when I send out the invitation, but I’ll be collecting an entrance fee and, adding my own contribution, donating that amount to the orphanage our group currently sponsors.” We thought it would end with being a fun party, but to see U-Know Yunho go out of his way to prepare such a great idea, left all of us feeling warmed to the core of our hearts. <10 Things I Hate About You> (1999) A teen romance film that follows the life of an innocent high school girl who is extremely popular, but has never dated anyone before. A prom party is used as an important plot point. <Never Been Kissed> (1999) Drew Barrymore plays the role of a reporter in her twenties who lies about her age and enrolls in a high school to report on it. There begins her romantic story of young love. <Prom> (2011) The main character is put in charge of putting together her high school’s prom party. The detailed concept of U-Know Yunho’s party comes from this movie. What should we do at the party? Games from the past! Program: Arcade are the greatest playgrounds ever. “When I was little, my friends and I would pile 100 Won coins on top of a gaming machine and go nuts, fighting our opponents. That was the game ‘Iron Fist’. If I set up that game at my party, my friends will never want to leave.” U-Know Yunho had a excited expression on his face as he said these words. It seemed he too was itching to play this old-school game for the first time in a while. He decided to add more games like Galaga and pinball machines as well. True to his word, his friends never left the gaming machines on the day of the party. Where should we do it? My friend’s restaurant! “The guy who runs this place is a friend I met in elementary school, and he ended up immigrating to Belgium at a young age. Since then, he’s returned to Korea to start a restaurant and work as a DJ. His Korean nameMo Ji Hwan and he works as a DJ under the name Gio Vanhoutte. The place is an Italian restaurant called ‘De Karmeliet’ and is located in Doonchon-dong around the Olympic Park.” U-Know Yunho visits the restaurant often and every time he goes, he says, “Wouldn’t it be so fun if we invited all our friends here and had a party?” His wish has finally come true. All his friends from their 85st group gathered on the third floor of De Karmeliet for his party. What kind of music? Upbeat electronic! How were we going to choose music that was appropriate for a prom-themed party? This conundrum was solved in an instant when U-Know Yunho said, “Don’t worry. Mo Ji Hwan, the owner of De Karmeliet, is a well-known DJ, and he has a close friend who can help out. Yes. My cousin is currently working as a DJ under the name ‘DiDi’.” He suddenly took out his phone and made a call. “Ji Hwan, can you make a playlist for the party?” He called up his cousin as well while he was at it. Thus came the simple decision that three DJs would be in charge of the music for the ’85st’ party! His real name is Lee Hoon and he made his DJ debut in 2009. He prefers house music that is well-structured, and is in the process of making his own unique mark in the industry. He currently DJs at hotels and lounge bars, and he is working to become a music producer. Gio Vanhoutte is a Korean Belgian who became friends with U-Know Yunho in elementary school. He became entranced by house music at a young age and began his DJ career in 2006. In 2012, he was chosen as the representative DJ of the W Hotel Asia Pacific. He is currently working as a global DJ who works all around the world. 2. U-Know Yunho is writing the invitation he will send to actor and friend, Sohn Ho Joon. 3. U-Know Yunho tries on the bracelet he will be giving out to his friends at the party to check over the design. The concept for the party has become much clearer. Now we must decide how to much the invitations and entry bracelets to send to his friends. For this part of the planning process, we invited an expert who specializes in party planning to help out. The person we called was Indicate’s Lee Dong Wook, who has dominated the party and event planning industry these days. U-Know Yunho worked with him to iron out the details. First began the discussions on the designs of the invitations. Snowflakes and bold, sparkling colors were used to go along with the ’85st club’ and ‘end-of-the-year’ theme of the party. 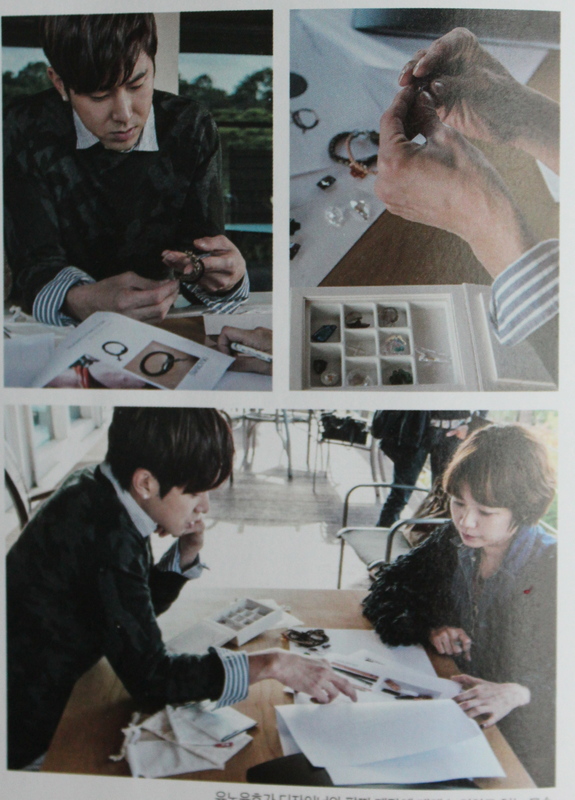 U-Know Yunho also began talking about making bracelets with Swarovski crystal pendants for his friends. True to his wish of, “I want to make bracelets for my friends to wear as they enter the party,” we immediately began creating bracelets for both men and women. The bracelets were a commemorative gift at the party and will also be released as a collaboration product in the future. The invitations were were hand-written by Yunho himself, and were placed in envelopes with a bracelet each (U-Know Yunho tied the bracelets around the wrist of each friend as they entered the party). [1. 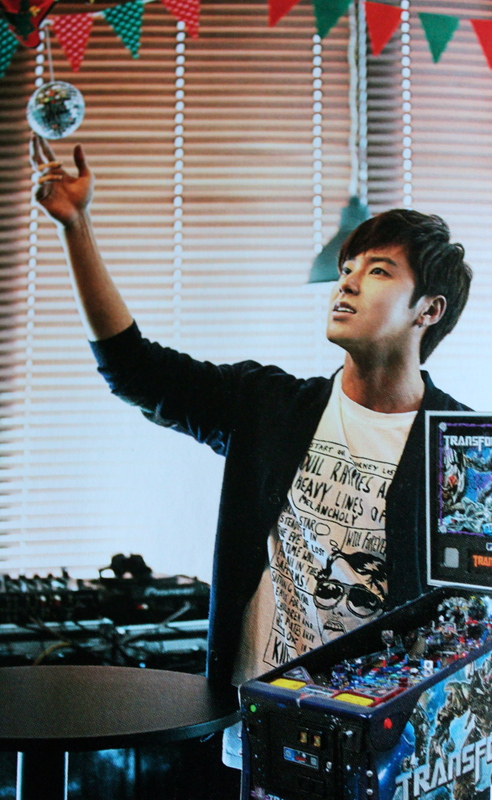 On the day of the party, U-Know Yunho checks over the DJ equipment before his guests arrive. 2. Taking a short break, U-Know Yunho sat down in front of the piano on the first floor of De Karmeliet and began playing for everyone there. 3. U-Know Yunho hand-wrote all the names of the friends who would be attending his party on envelopes provided by <The Celebrity>. The envelops will contain each guest’s entrance fee. Party planner Lee Dong Wook is a veteran of the industry who has been planning parties and brand events for 10 years. He has been specially invited to help plan U-Know Yunho’s ’85st’ party. From the start, U-Know Yunho stated that he wanted his party to be a combination of a ‘prom party’ and a ‘end-of-the-year party’. 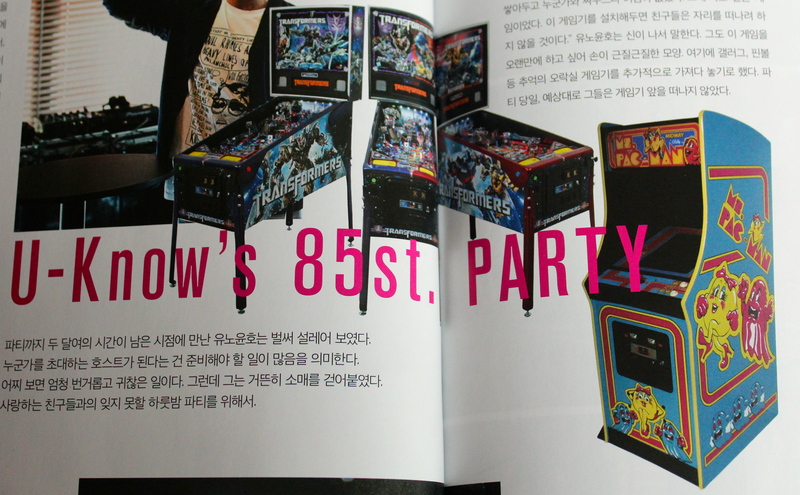 Following his opinion that ‘There have to be arcade games at the party’, Lee Dong Wook made sure to deliver gaming devices to the party that guests could play Iron Fist, Galaga and pinball on. What was most difficult was that most devices were quite dirty because they were so old. But Lee Dong Wook was able to find clean, almost new, gaming devices. He also prepared the best sound system he could find for U-Know Yunho’s friends who would be DJing for the party. With the perfect sound system and lighting equipment, U-Know Yunho and Lee Dong Wook made sure to look over everything, down to the smallest detail, before the party. [1. A variety of cheeses were laid out to go with the aperitif of champagne. As De Karmeliet, the location of the party, is an Italian restaurant, U-Know Yunho worked with Chef Choi Jae Hyuk (who graduated from Italy’s Parma Cooking School) to create the menu for the party. U-Know Yunho wanted to prepare enough buffet-style food for thirty people, more than enough to feed all his guests. This was his basic principle. There were three things that stood out amongst the party food. fusilli with pounded cheese and basil pesto, salmon gravlaks, which requires the salmon to be ripened for 12 hours with a variety of ingredients like brandy and lemon zest, as well as cantuccini, toast grilled in the oven with butter, sugar and almonds. U-Know Yunho had a hand in everything, from choosing the menu to setting the table, and these dishes were extremely popular amongst his friends. Most of the guests attending the ’85st’ party are used to the party scene. They are a generation that isn’t afraid to eat, drink and have fun, and they are always clear in what they want. 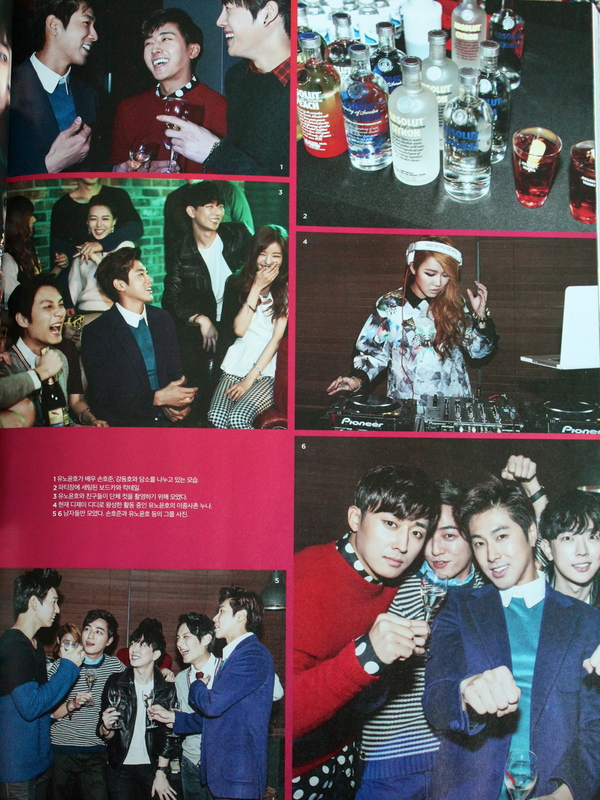 U-Know Yunho chose three types of alcohol for the party that would begin at seven. First, he prepared an aperitif of champagne for his guests as they entered the venue. This was because the sparkling flavor of the champagne would heighten the taste of the Italian buffet. When the party got started, vodka-based cocktails were prepared as vodka is considered to be the drink of the younger generation and is perfect for whipping up quick and easy cocktails. Last of all came tequila, and U-Know Yunho showed great interest in the skills of the mixologist on site. [1. U-Know Yunho tastes the pasta that will be served at the party by De Karmeliet’s staff. 2. After greeting Chef Choi Jae Hyuk, who studied in Italy, U-Know Yunho expresses his hopes for a great feast of food for his friends. 3, 4, 5. Dishes that were served at the party. 6. U-Know Yunho checks over the dishes on the table using a printed menu. U-Know Yunho’s friends arrived earlier than the set time of seven o’clock. Whenever each person entered the venue while saying, “Both members of TVXQ hate it when people are late. Their friends are like that too,” U-Know Yunho greeted them with a bright smile. He collected his friends’ entrance fees and placed them in envelopes that had their names written on them by the singer himself. He had told all his friends in advance, “The entrance fee is 20,000 Won. We’ll be using this money for a good cause.” He even tied bracelets on for each of his friends as they arrived and showed off his design. Photos were taken at a photo wall that had been set up at the entrance. We got the impression that U-Know Yunho is quite an affectionate and caring person. And he really is. U-Know Yunho is a real man. [1. Actor and musical actor Kang Dong Ho, who has appeared in various productions like <You Who Rolled in Unexpectedly>. 2. 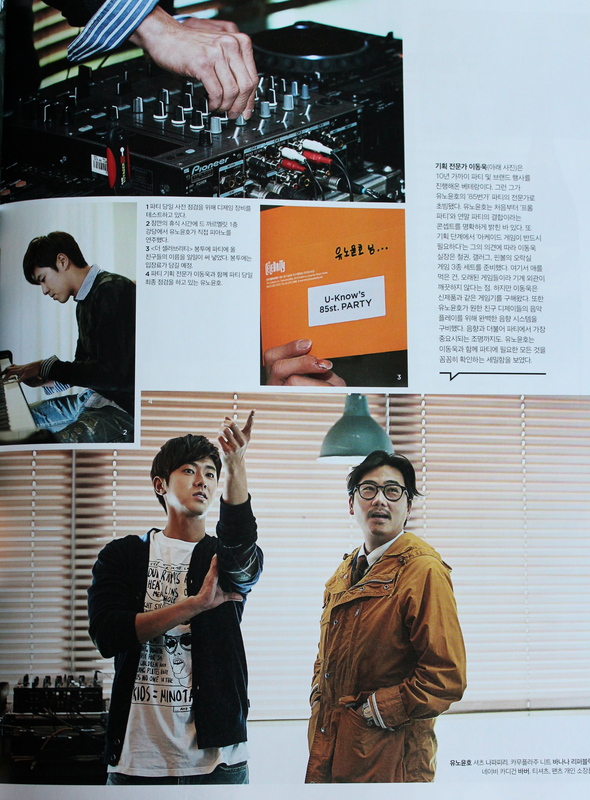 U-Know Yunho and DJ Gio Vanhoutte, who is also the CEO of De Karmeliet. 3. Han Seon Soo, who plays center in Korean Airline’s volleyball team, with his wife, former actress Sung Si Hyun. 4. Singer Beige, who has sung many popular OSTs. 5. Kim Eun Jung, a member of the girl group Jewelry. 6. U-Know Yunho’s friend and dancer, Choi Jung Seop. At seven p.m. on a cold, early-Winter’s night, ‘De Karmeliet’, a medieval European themed restaurant located in the heart of Doonchon-dong, Kangdong-gu, was filled with U-Know Yunho’s friends for an unforgettable night of partying. The party was hosted by TVXQ’s U-Know Yunho and gathered approximately thirty friends in his ’85st’ group, which includes fellow partner of ten years Max Changmin, and Super Junior’s Kang In. Here is a record of the fun times U-Know Yunho and his friends had together. [1. U-Know Yunho shares a conversation with actors Sohn Ho Joon and Kang Dong Ho. 2. The vodka and cocktails that were set up for the party. 3. 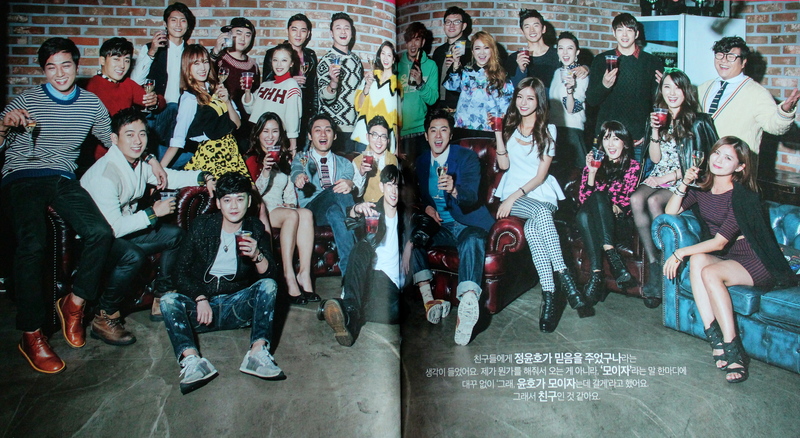 U-Know Yunho and his friends have gathered for a group photo. 4. U-Know Yunho’s cousin, who is currently working as a DJ under the name DiDi. [1. U-Know Yunho holds a camera in his hands as he takes a group photo. 2. 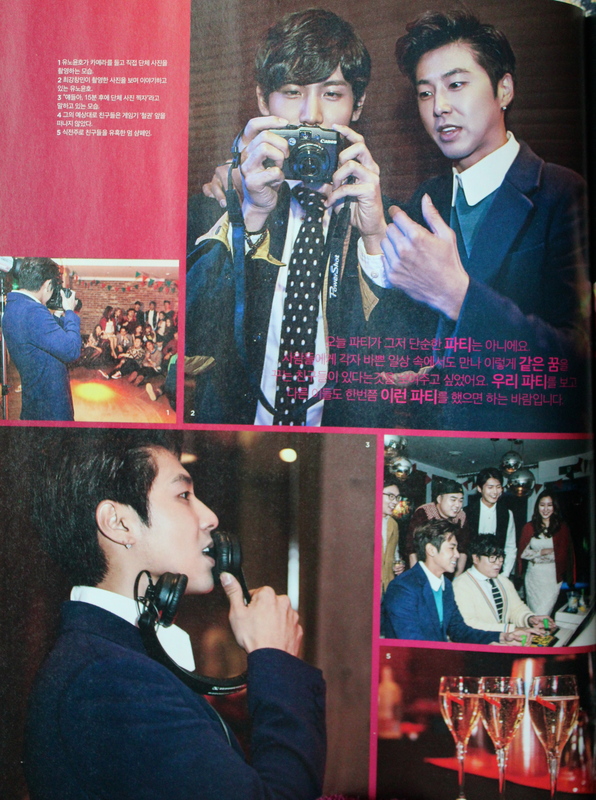 Max Changmin and U-Know Yunho are conversing as they look over the photos that Max Changmin took during the party. 4. As he’d predicted, his friends stay glued to the ‘Iron Fist’ gaming device. [1. Jewelry’s Kim Eun Jung, Dancer Choi Jung Seop, Actress Park Soo Jin, Rookie actor Byun Sung Beom and Singer Beige are having fun. 2. 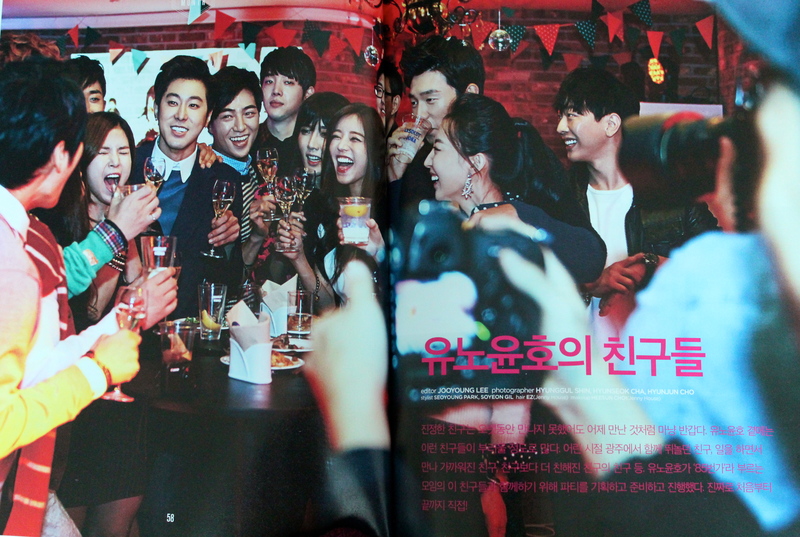 At the beginning of the party, U-Know Yunho held a flute of champagne up as he talked about his friends. 3. Max Changmin is taking a photo of U-Know Yunho at the DJ booth. We met with U-Know Yunho, who will be celebrating the 10th anniversary of his debut this year. This was five hours before the start of the ’85st’ party he had planned himself. At the time of the interview, he had already participated in heated discussions with the party planner, light and sound director, and chef. Our discussion with him began with a glass of fruit juice to calm his buzzing excitement. We were actually quite surprised. The interview that began with the topic of ‘the interrelation of U-Know Yunho and Jung Yunho’ began evolving into a discussion about life and how to live it. It felt like we were sitting across from a philosopher who dances across the stage and reflects on himself. So this is the story of the history and philosophy of a young boy who held Michael Jackson in his heart and danced in the middle of a lake park in Gwangju. You’ve held the position of the leader of Asia’s greatest group for the past 10 years. You must feel quite emotional when you look back on the passing years. I believe that I was the person who was changed most by my decision to take on the position of this group’s leader. With the group bringing together people who each came from different lives, I thought about nothing but doing my best at first. As time went by, we became close, and I began to understand when I should step back and concede, and there were times when I realized something wasn’t as easy as I’d initially thought. There were things that were too hard for me to handle at such a young age. But I think it helped me grow more as a person. Can you be more specific about how you’ve grown? Looking back on everything, so many things have happened to us. The saving grace of all these happenings is that they have made me look around me more often. My eyes were opened to so many things. It made me feel so grateful to the staff members who had stayed by our side. What’s important is that all of us work together in the creation process, no that I, or we, do well. Then what is the interrelation between U-Know Yunho and Jung Yunho? I began my social life much quicker than most people. So there are times when U-Know Yunho acts like a precocious child as a social figure. Because the entertainment industry is about interacting with people, U-Know Yunho quickly picked up on when he should make concessions and when he should be more stubborn. But I feel like Jung Yunho is a kid who’s frozen in time as a high-schooler, because he had to make room for the new character of U-Know Yunho. That’s quite a meaningful statement. Jung Yunho’s time has stopped, and a new story has grown from it. U-Know Yunho is a kid who has to face a large number of people and has a lot of work to do. He also has the image of a leader. But Jung Yunho is quite an innocent and carefree kid. What’s a relief is that both have quite a positive personality. The past 10 years must be filled with glimpses of countless memories. Which moment would you choose as your best? It has to our concerts. I’m happiest when I’m standing on stage. I think that the performance that has left the deepest impression in my mind is the SMTOWN concert I performed in with Changmin for the first time since becoming a duo. The responsibility of having to the fill the stage with just U-Know Yunho and Max Changmin after a long hiatus was quite a heavy burden to bear. But I see that moment as something that signaled a new stage in our lives. It was a new beginning, and it felt like we had become rookies all over again. There must have been a huge number of fans in the audience. How did you feel? Right before I got on stage, my fear disappeared completely. Since then, we’ve continued to break TVXQ’s previous records and we kept moving forward. Things like our Tokyo Dome concert record, and our 850,000-audience tour in Japan. We thought that the hardest thing in the world would be to break our own records. Because it’s a battle with yourself. That first stage that I talked about became the driving force of our struggle, so I’ll never forget it. Could we ask you to share one more memory with us? It would probably be about when we first stood on stage during our Tokyo Dome concert in Japan. That was the first time I’ve ever cried on stage before. (You’ve never cried on stage before?) I’ve never cried on stage, not even when we won awards. It’s because of the promise I made with my deceased grandfather. I promised that I would only cry when I became the best. Though I always felt the emotions well up inside of me, I’ve never cried. The reason why I cried on that stage is because I realized that singing wasn’t the only thing I had to do from then on. I think I cried because it was a stage that helped me come to a philosophical realization that as a public figure, I have a responsibility to give back everything I’ve received. It must be hard to endure the path to the top that keeps going higher and higher. I talk a lot with my father, who I respect most in this world. Let’s say that we’re talking about a mountain, like the highest summit in Mt. Moodeung in my hometown. My father would always tell me that I would have to reach that summit in order to see the summits of other mountains. If you can see Mt. Baekdu’s summit from there, you have to walk down from the summit of Mt. Moodeung and get back on flat fields to make your way to the summit of Mt. Baekdu. And this goes on and on. It’s because you can’t see the summits of other mountains from the middle of your mountain, since it’s shrouded by clouds and fog. This is life, according to my father. How many times have you reached the top and come back down during TVXQ’s activities? Though I spent a long time as a trainee, TVXQ became extremely popular from the start with their first album. That was one summit. When we went to Japan, we went back to the mindset we had during our days as rookies. We’d come back down to the flat fields. That was our trip up and down Mt. Moodeung. We then climbed and came back down from Mt. Baekdu. Right now, we’re in the process of climbing Mt. Everest. I’m beginning to realize that the higher we climb, the more of the world and sky we’re able to see. Then what’s your next goal? Right now, we’ve climbed down a little to focus on our next goal. I want us to make our own mountain. I believe that this is what I’ll be doing in life from now on. It may be through music, or it might be by staying close to my circle of friends. It could be musically as the artiste U-Know Yunho, or it could be as the rookie actor Jung Yunho. These are the things that help me make my own mountain. You’ve received so much love from the public. You must have a lot of thoughts on that. The job of a musician can only bloom if he is loved. Love is something people can get used to if they keep receiving it. I’m the kind of person who believes that you should give back more than you’ve received. When did you start having that mindset? Since I made my debut as a member of TVXQ. In 2006, something bad happened to me. That’s when I started thinking, ‘Even unwillingly and unknowingly, I could make people dislike me, and cause them harm.’ I like to walk a lot whenever I have the time to. While walking, I see a lot of people. It makes me realize that there are so many people in this world who work much harder than I do, putting aside the monetary aspect of things. There are faces glowing with the happiness that comes from the small things, and faces that are saddened by rewards that are smaller than expected. That’s what life is. If I receive, then I should give back. Only then will the love I received turn and turn, till it comes back to me. My belief in this becomes stronger as time goes by. Do you believe in, ‘Never lose one’s original intentions’? Even now, I always visit the lake park (Ssangam Park) in Gwangju whenever I go back. I always find myself longing for that place when times get tough and worrisome. Back when I used to dance there as a teen, I felt so unsure about my future. Every time I accomplish something, something big happens and I end up with more things to worry about. Whenever that happens, I try to ground myself by saying ‘Go back to your roots’. I think about the times when we, including the friends who were there with me, had nothing. The time when we did nothing but dance, because we loved to dance. Now, TVXQ have become artistes with seniority. There are many juniors who pick TVXQ’s U-Know Yunho as their role model during their interviews. What advice would you give them as their senior? I always say the same thing. No matter what you do, as long as your work hard, you will always become better, even in the most minuscule way. But once you lose a relationship you had with a person, it’s difficult to get that back. If you know how to take care of those around you, your 100% effort can be heightened to 200% or more. Our profession puts us in the spotlight, and I’d advise my juniors to not get used to it too much. You need to be able to enjoy things while you still can. Because moments don’t ever come back once they pass. In conclusion, if you do your best every day, life will be a joy. But you must feel a sense of wary crisis when you see your juniors rising ranks so quickly. I don’t think I’ve ever thought of it as a competition with someone else; it’s always been a battle with myself. What’s strange is that when I see other celebrities, I get amazed and say, “Wow, it’s a celebrity.” Maybe that’s why, but I think of it as a battle with myself, and myself only. The system’s gotten much better for our juniors, who are also much more talented than we were when we first started. There’s nothing we can do but work hard to go against them. This guy’s pretty good? Then I need to work harder. On stage, I do my best to have as much fun as I can. If I change the way I think like this, I can become more positive. With the end of the year approaching, could you organize your feelings about the fans who have loved TVXQ’s U-Know Yunho till now? I think I’ve formed a closer friendship with my fans. The passing times have taught me that they are like another member of TVXQ because they cry with us, they understand us, and we create the group’s legacy together. There are times when we bicker, but they will always be family to U-Know Yunho. Fans are the people I can connect with, without having to say a single word. TVXQ have an extremely large fanbase. Are there any fans who you remember from the past 10 years? I can talk about a hundred, even a thousand, fans who I can remember so vividly. Personally, I like to talk to my fans like an older brother when I meet them. If I see any students coming to our office too often, I tell them not to come anymore. I tell them to go study first, and see us later. I think that’s the kind of relationship I have with my fans. I want to be a good influence on them and not affect them in a negative way, to repay them for all the support they’ve given us. My thoughts keep turning in that direction. 2013 is almost over. As U-Know Yunho, the musician, what will be the last thought in your head before you fall asleep and wake up to greet the new year? If you were to reflect on yourself a little early this year, what do you regret most this year? Does U-Know Yunho have a life principle he follows? There are a few things I always have written down because I never want to forget them. I think those are my principles of life. ‘Never regret your decisions.’ This is my first principle. It’s okay to worry and think about all available options before you make your decision. But once you’ve made your choice, you should never have any regrets and should always move forward. That’s the only way you’ll be able to stand your ground, even when you get unwanted outcomes as a result. 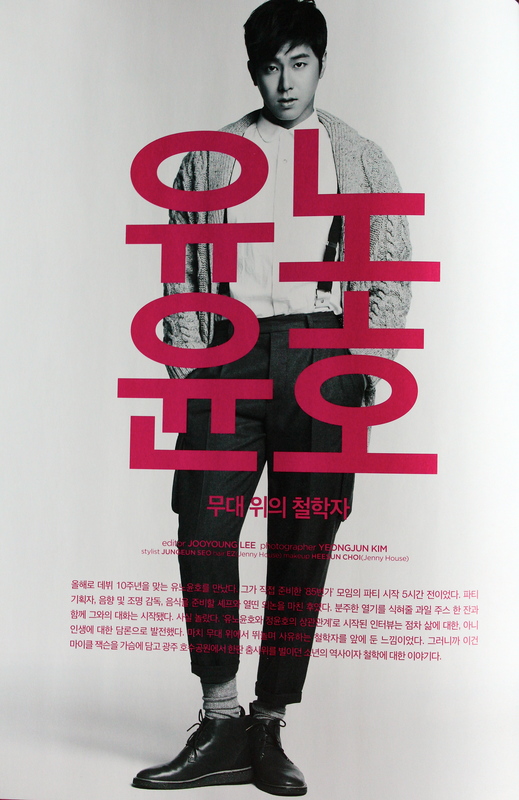 This is the main principle of U-Know Yunho, as well as the life philosophy of Jung Yunho, the human being. Five minutes before the interview, Max Changmin entered the room with a heavy-looking camera in his hands. It was the same case every time. In the first interview, and the second, and the third. Not once did he break his promise with us. And he would show off the photos he had taken. Quite a lot of photos had been taken and stored in the camera. Max Changmin is that kind of person. A sincere person who keeps his promises, no matter what. A person who thinks of others before himself. Though he is a member of TVXQ, a group that has experienced the greatest popularity in all of Asia for the past 10 years, there isn’t a single trace of arrogance in his bones. How is it that this youth in his mid-twenties, who still has so many things he wants to do with his life, has stayed so honest and hardworking? We sat down with Max Changmin, who admitted that there are times when he wants to act perverse, and live a life more interesting than the one he leads now. Your twenty-sixth year of life is coming to an end. What’s changed? The biggest change is that it’s been more than a year since I started living by myself. So I’ve been enjoying the happy single life since then. I sometimes think about the meals my mother used to cook for me, and at other times, I start to miss sharing a dorm with Yunho, but I’m still enjoying the fun in the concept of ‘I live alone’. What do you usually do when you’re alone? You must cook as well since you live alone. When I first moved out, I was so full excited and ready to go. I would go to the supermarket to buy my own ingredients and cook this and that. I’d call Kyu Hyun over, since he lived nearby, to share what I’d cooked. I’m pretty sure the first dish I made was soybean stew. (laughter) But that excitement was short-lived. Because of my busy schedule, I don’t get to spend a lot of time at home. Seeing the ingredients rot in my fridge made me want to cook less and less. These days, the only cooking I do is when Kyu Hyun comes over for a drink and I make some steamed eggs to go with the alcohol. It seems that you’re very close to Super Junior’s Kyu Hyun. You keep bringing up wine. Is it your choice of alcohol these days? Haha. It hasn’t been long since I became interested in wine. Kyu Hyun bought me a wine cellar as a housewarming gift, and I got interested in wine when I started filling up the empty wine cellar. Because I started taking an interest in wine, Kyu Hyun gave me a copy of the comic book <God’s Drop of Water> and said it would be of use to me. I’ve read it and it’s a fun but difficult subject. The world of wine is so vast and enormous. I bought a couple of bottles of wine during a recent trip to the US, but I’m not exactly sure what they are because I just bought the ones that were recommended to me. What type of wine appeals to you most? Wine that I can enjoy with people I like appeals to me most. I don’t think that a wine’s vintage quality or price are its important factors. For me, the most important thing is who I’m drinking with and what the atmosphere is like. I don’t drink when I’m depressed or having a hard time. I prefer to have a drink when I’m feeling good and having fun; it doesn’t even have to be me raucously partying it up or something. You have a strong image of an ‘honest and decent youth’. 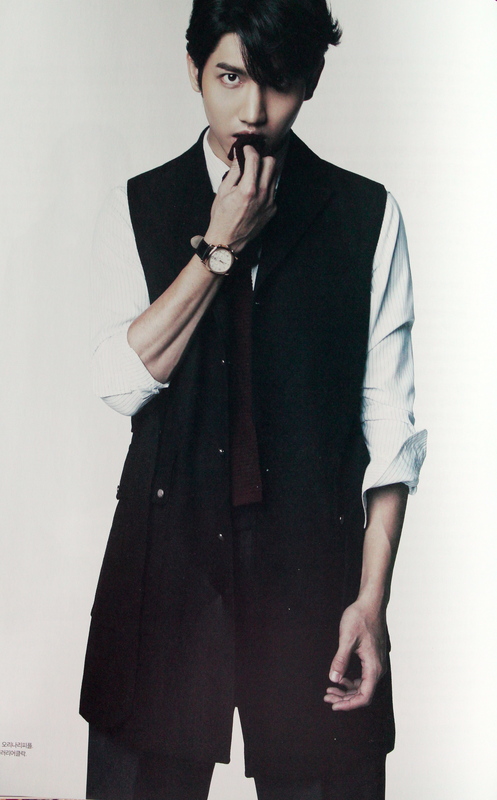 But I’m sure there’s a side of Shim Changmin that no one knows about. I really hate doing things that may bring harm to others. So I’m very cautious when it comes to interacting with others. I’m grateful that people see that as me being an honest and decent youth. On the other hand, there are people who say that they find it difficult to approach me because of such an image, but I’m actually a very open person. What do you mean when you say you’re a very open person? Are you very open when it comes to relationships as well? Of course. But I’m really enjoying the single life right now. I might wake up tomorrow to find that I’ve experienced a change of heart, but right now, I’m enjoying the time I get to spend by myself. To be honest, I’d like to meet someone great before I get sick of the single life. Have you ever deviated from your normality? Haha, I’ve never wanted to deviate from normality, but if I ever feel like I’m suffocating, I’ll go for a drive in the early hours of the morning, or go hiking. That’s all I need to heal my soul. If you were given a month off to take a break, what’s something you would really want to do? Wow, that sounds like a dream. (laughter) I think I’d go to a temple for a week, empty my thoughts and rest up. I’d go hiking every morning, go fishing, and eat the meals the temple would provide for me. I’d also want to go backpacking with my close friends. When my school friends tell me about their backpacking travels, I get so envious of them. One day, I’d like to travel across Europe with nothing but a backpack slung across my shoulders. Why do you work so hard for <Our Neighborhood’s Master of Variety and Sports>? Even I didn’t think I’d get so attached to the show when I first started out. I discovered that I’m quite a competitive guy. (laughter) There are times when I get injured while training or playing in a game, but I end up forgetting it all when filming starts. It’s so much fun. All the people I work with, like Ho Dong, really feel like family to me. We all have such a great time together and it feels more like meeting up for a sports club fun than filming for a show these days. Most of all, it’s fun because people who really enjoy sports can come together and take on different sports. Because of my busy schedule, I’ve never had a lot of time to pick up a sport. There’s nothing I can keep doing for a long time other than dancing, but I think <Our Neighborhood’s Master of Variety and Sports> has helped my mental health a lot. We’re hard at work honing our basketball skills these days, but I’m already excited to see what we’ll be doing next. It seems as though filming for <Our Neighborhood’s Master of Variety and Sports> has brought about a great deal of change in your life? It’s true. I preferred to be static in the past, but I’ve become more outgoing since appearing on <Our Neighborhood’s Master of Variety and Sports>. I can feel that communicating more frequently with people is making me more extroverted. Could we interpret that as your non-singing activities bringing about a new kind of change in your life? Taking a shot at doing something new in a variety of fields has a positive effect on me. Of course, this is true as long as I keep my roots as TVXQ’s Max Changmin, Though I was scared at first when I started acting for the first time, I’m certain that new challenges and experiences help me grow and lead me in a direction that’s good for me. How long does it take a person to become friends with Shim Changmin? I have a lot to say about that topic. Although it’s true that I’m a little shy around strangers, it’s not that difficult to get close to me. When I’m faced with such misunderstandings, I find myself feeling a bit sad. I prefer to listen to other people than to talk about myself. When I first became friends with Kyu Hyun, he would say, ‘Why do you never talk about yourself?’ I think it’s usually the case that I may feel as though I’ve become every close with someone else, but they may not feel the same way. So nowadays, I work hard to show that side of myself to others more often. Wouldn’t you feel better and less stressed if you talked about everything on your mind with people you’re close to? I know, right? I think I used to be stuck in the mindset that I had to always respect others. It may be because my personality is like that to begin with, or because my social life began at an early age. But I’ve changed a lot recently. I’m better at expressing myself when I like something, and when I don’t like something. You were in your teens when you made your debut as a member of TVXQ. That’s an age filled with so many dreams and things you wish to accomplish. In the early days of my debut, I would sometimes get lost in the thought of ‘Why can’t I just live a normal life like all my friends?’ This was despite the fact that I was enjoying a great deal of popularity at that time. But as time passed and I spent more time as TVXQ’s Max Changmin, I would start asking myself, ‘If I hadn’t become a member of TVXQ, what would my life be like now?’ TVXQ is the greatest gift and good fortune of my life. Even if I could travel back in time, I would choose the life of a member of TVXQ again. It’s already been 10 years since your debut, and so many things must be flashing before your eyes. Do you remember any good times or bad times in those 10 years? The three years right after my debut were the hardest. At such a young age, I don’t think I was able to handle the fact that I had gone from a normal student to a person standing in the middle of the spotlight of so many people. I would feel elated from the attention and love of our fans when I stepped out, but the despondency I felt when that moment passed and I was alone again was too much to handle. Should I call it a sense of awareness that comes from a different environment? If you think about it, it’s something that no one else can solve for you. But time helped me iron everything out. I started getting used to my new life and began making goals for myself, which helped me enjoy the stage more and experience more happy moments in my life. Since then, I’ve valued and found joy in standing on stage as TVXQ’s Max Changmin. So what I’m trying to say is that right now, in this very moment, I am truly happy. You have more juniors than seniors in the industry now. How does that feel? I’m happy because I like to think of it as gaining more friends than gaining more juniors. I’m still young, aren’t I? (laughter) There will come a time when I’m not as popular as I am now, and there will come a time when I won’t be able to stand on stage and give a great performance because of my age. I never used to think about things like this till recently, but these thoughts appear in my head when I see my juniors performing. But I don’t just feel sad when I think about things like that; I’ve begun to slowly accept it for what it is. But I will still continue to do my best and create an amazing performance as a member of TVXQ. Is there anything you wish to accomplish as TVXQ’s Max Changmin in the future? I’m sure it’s the case for all singers, but I’m very determined to create great music. I believe that we’ve showcased our own unique color quite well till now. But I’d like to be more recognized as an artiste, because recognition is something I should expect, right? So I always think about trying out new genres of music. I talk about this a lot with Yunho. Then, I guess we should expect to see a side of TVXQ in your next album? Of course, We won’t disappoint. What is most precious to Max Changmin right now? You’ve spent more than 10 years of your life with U-Know Yunho. Is there anything you’d like to say to him? You can’t leave out your fans who have stayed by your side for 10 years. I’m sure the fans have a lot of things they’re disappointed about when it comes to me. Because I’m not very good at expressing my gratitude. I really want to tell the fans just how precious they are, and just how much of my life they have touched. I’m not very good with expressing myself like this, but I truly love them. What would Shim Changmin ask Max Changmin, and what would be Max Changmin’s answer? I would like to ask, ‘Max Changmin, what is your goal in life?’ This is a question that I get asked a lot during interviews. But I’m still not sure how I should answer this question. I thought long and hard about it, and I came to the conclusion that I don’t have to live with a definitive goal in my life. I believe that as long as I do my best and enjoy what I do, whether I’m on stage as a member of TVXQ or acting or appearing on a variety show, I will live a happy life. And I’m sure that great results will be waiting for me at the end of that happy life, whether I was the one put them there or not, right? Near the end of the Summer season, we met with him at a studio in Gangnam, in order to talk sincerely about photos face-to-face, something we’d only been able to do over the phone due to his busy schedule. Waiting for Max Changmin was a camera, something he had wanted so desperately, as well as a mentor he’d wanted to meet. That is where he began learning about photography and taking his first photos. “I’d like to learn from Kim Young Joon.” As soon as the words were out of his mouth, we picked up the phone and called photographer Kim Young Joon. But his schedule was as packed as Max Changmin’s as he is renowned photographer who is requested by countless stars in Korea. 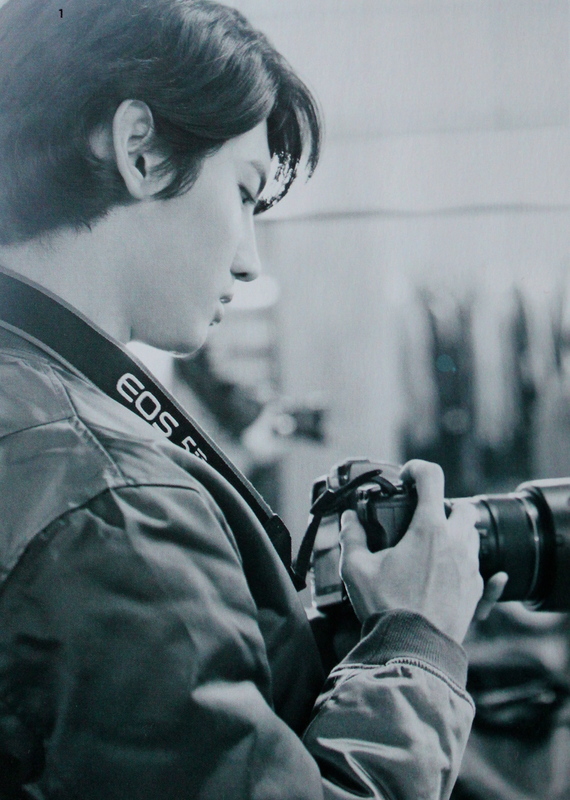 “If Changmin wants to learn photography from me, then I’d be glad to teach him.” This marked the beginning of Max Changmin’s journey to becoming a photographer. Time wasn’t an issue for the duo. Max Changmin would run over to the studio in the early hours of the morning when he was done with his other scheduled activities, and Kim Young Joon would be there, waiting to talk for hours on end about photography. 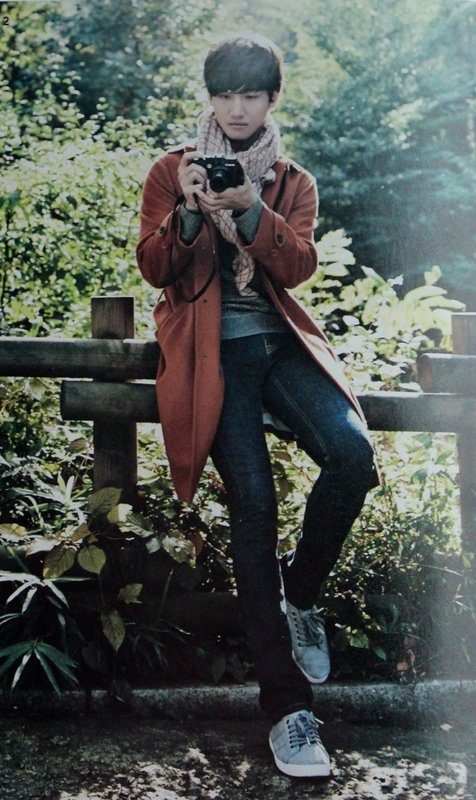 Three months passed, and Max Changmin finally held a camera in his hands. And in order to take the ‘photos’ he’d wanted to take, <The Celebrity> and Kim Young Joon came together to create a huge plan for him. For a beginner, it may be too much to hold a big and bulky DSLR from the start. The journey begins with holding a compact camera in your hands and taking lots of photos wherever you go. No matter what the subject of your photos is, you should take lots of photos, and find the angles that work best. You should begin to use a DSLR when you’ve become used to taking photos. “Even I was surprised by Changmin’s passion. I didn’t think he’d work as hard as he has.” When asked how he felt about the time he spent with Max Changmin, this was his answer. He couldn’t deny that he a preconceived idea about what Max Changmin would be like, since he’d never actually held a deep discussion with the singer who had stood in front of his cameras countless times in the past. “I thought it was just a spark of curiosity at the beginning. So when he first expressed the desire to learn about photography, I was only half-convinced. Three months later, I’m still amazed and surprised by his consistently sincere and hard-working attitude.” Max Changmin has never broken a promise or missed out on a homework assignment from him. Once, he gave Max Changmin a homework assignment because they would not be able to meet for over a week due to the singer’s overseas schedule. The singer’s mission was to fill a memory card with whatever photos he wanted to take during the week. To be honest, Kim Young Joon wasn’t expected much but the next time they met, he felt extremely proud when he saw that Max Changmin had filled up most of his memory card. “Changmin said to me, ‘Please don’t see me as a member of TVXQ, just as an assistant to wants to learn about photography.’ I could feel his sincerity in those words. So how could I be anything but passionate while teaching him?” Though Max Changmin’s lessons are over, he still calls and asks questions about photography. As the student of Photographer Kim Young Joon. The reason why he chose the zoo as Changmin’s first project? One month into his photography journey, Max Changmin decided to go out and put what he’d learned during his photography lessons into practice. And his first location would be the zoo. 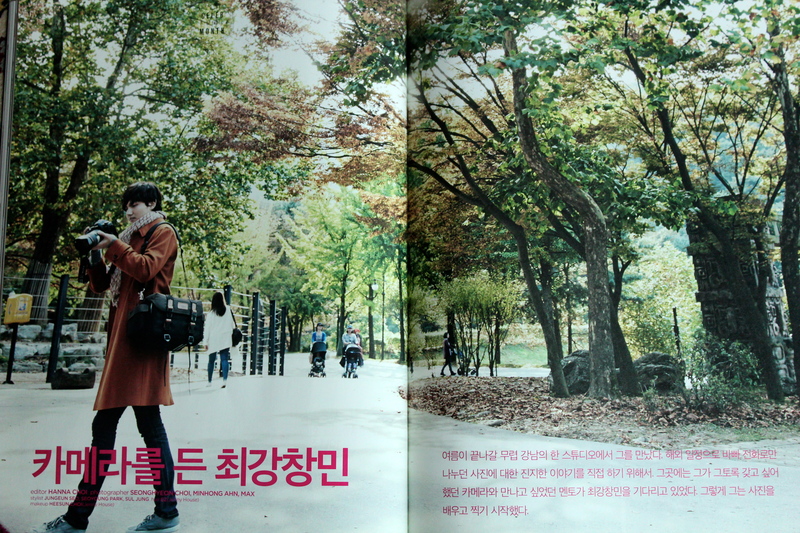 “When Photographer Young Joon first told me that we’d be going to the zoo, I thought to myself, ‘The zoo? Why the zoo? What should I be taking photos of?’ He explained that since I had an interest in taking photos of people, the zoo would be the best place for me since animals have as many expressions and poses as humans do, and I couldn’t help but nod my head in agreement.” The purpose was great. But the problem was the fact that he is Max Changmin. Taking into consideration the act that hoards of people flock to wherever he goes, we decided to take our trip to the zoo early on a weekday. We started looking for a big zoo that would have a lot of things to take photos of. Which was when we came to the decision to go the Seoul Grand Park. 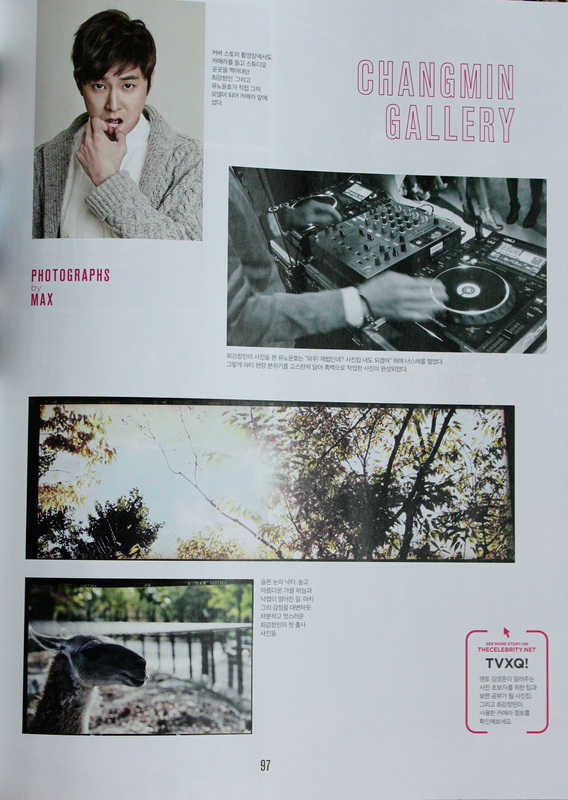 The warm Autumn sunlight, falling leaves and animals greeted Max Changmin on his first project. The sky and the sun, the trees and the animals, even children who were out on a picnic. He took photos of the many things he wished to capture on film. Times passed, and the spent a meaningful day together; Changmin taking photos till the sun starting setting and Kim Young Joon quietly following him around. [1. He would even travel into the deepest parts of the zoo’s forest to get the best photos. 2. Even during his break, Max Changmin always kept his G16 Compact camera close by. 3, 4. 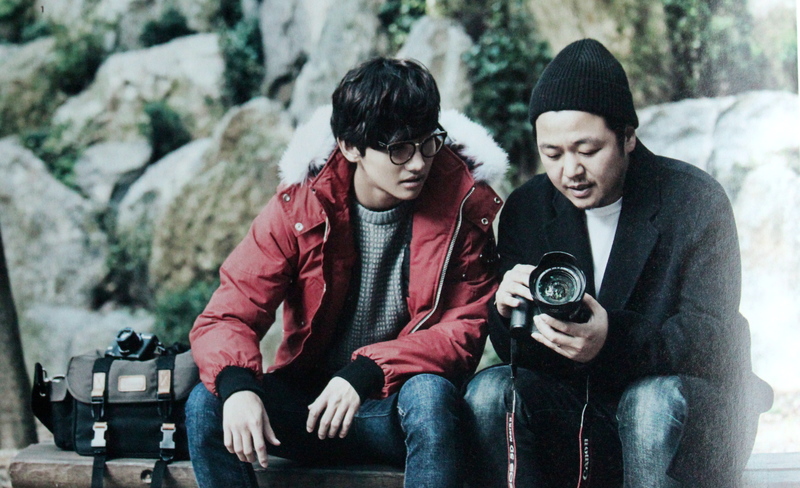 Max Changmin listens closely to Kim Young Joon’s explanations about the photos he took. [1. 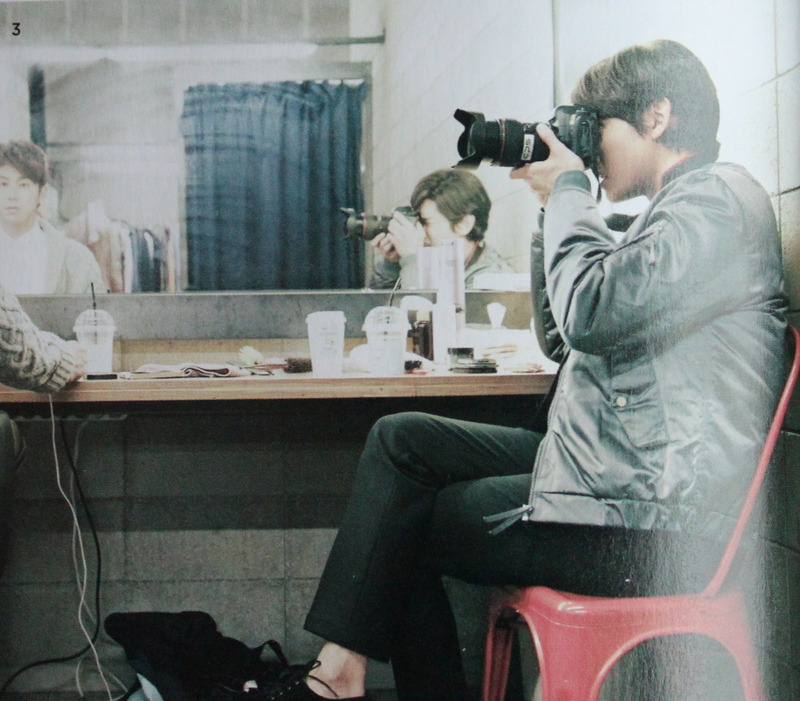 Max Changmin is taking photos of U-Know Yunho as he transforms into a DJ. 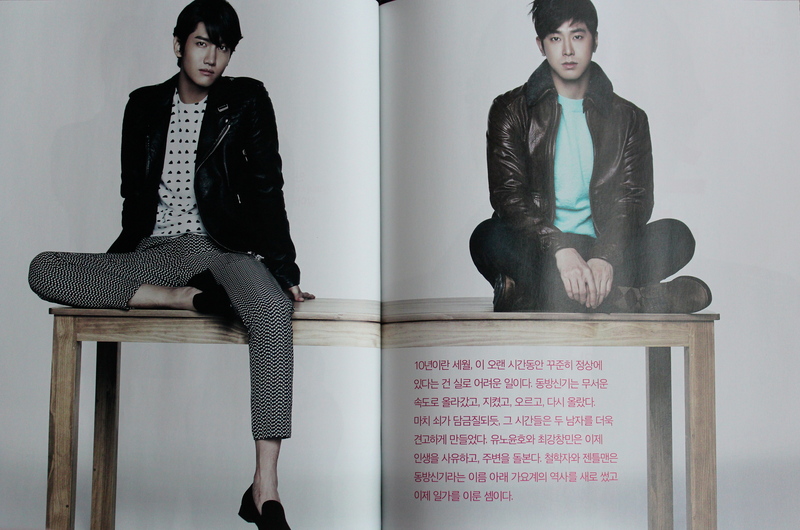 “Not long ago, U-Know Yunho sent me an invitation to a party he was holding. He asked me to come as a photographer. Although I worried about this responsibility, I told myself that I should dress up and go since this was his first-ever party for his friends. 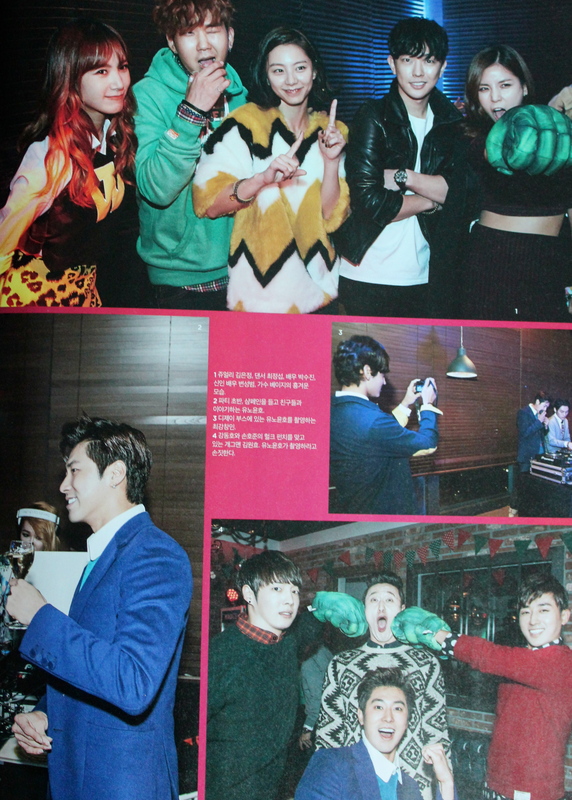 (laughter)” At U-Know Yunho’s ’85st’ party, Max Changmin worked hard to take photos at U-Know Yunho’s request. “Changmin, come over here and eat something!” Max Changmin was hard at work, without a spare moment to enjoy the party, when U-Know Yunho called him over. But he continued to focus on his work as he said, “In a minute. I just want to capture this moment here.” It was only after a while of taking photos that Max Changmin picked up a cocktail. “I’m thinking of making an album for Yunho with all the photos I took today. That means I have to do my best and take good photos, right? (laughter)” Quenching his thirst with the cocktail in his hand, he jumped right back into the party with a camera in his hands. 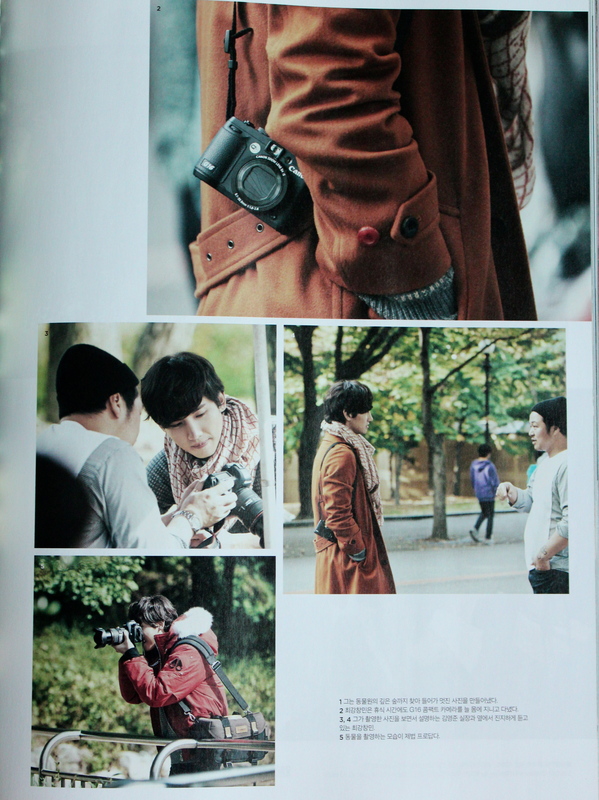 The first photograph collection I showed to Max Changmin since he was interested in taking photos of people. Steve McCurry is a photographer who is able to convey people’s situations, thoughts and emotions in one photograph. The photo he took of an Afghani girl best representatives the style he strives for. 1. 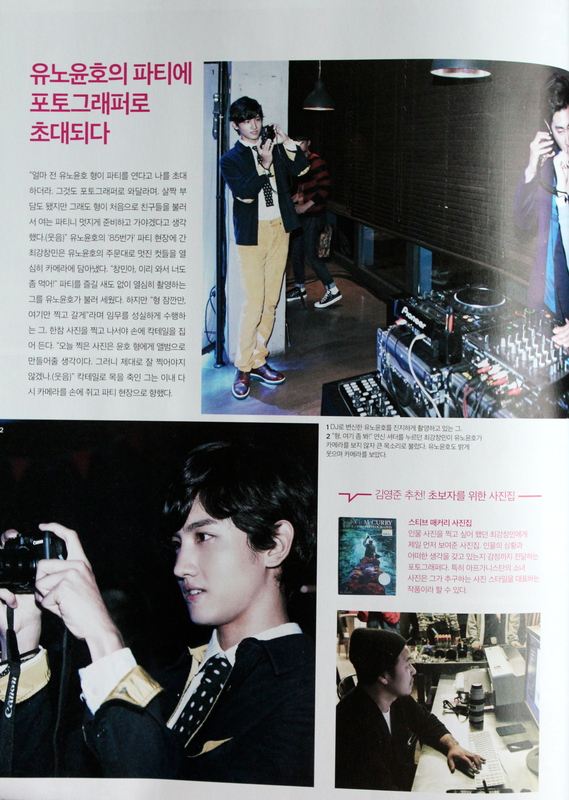 Even during the cover story photoshoot, Max Changmin walked around the studio to take various photos. 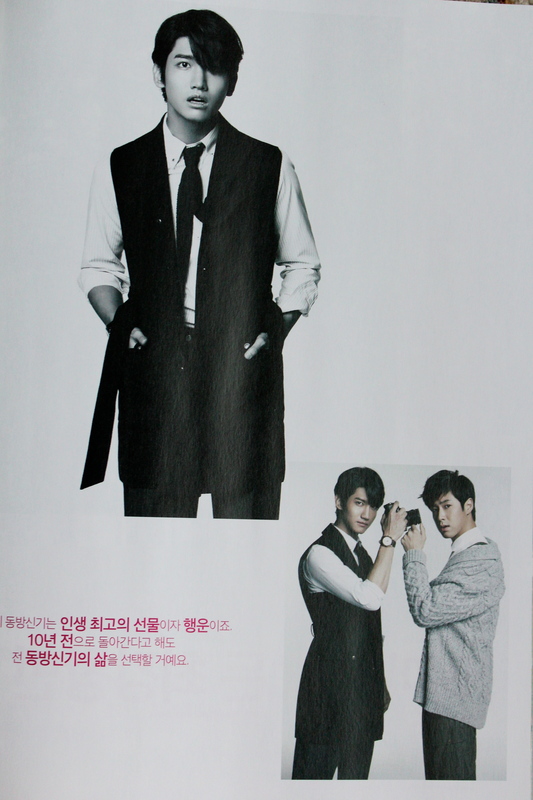 U-Know Yunho became a model for him and stood in front of the camera. 2. Seeing Max Changmin’s photos, U-Know Yunho said, “Wow! You’re pretty good, eh? You could release a photo collection now, huh?” Max Changmin took the photos he took at the party and converted them into black and white photos to create the final product of his work. 3. A camel with sad eyes, the never0ending, beautiful Autumn sky, and a path filled with scattered fallen leaves. 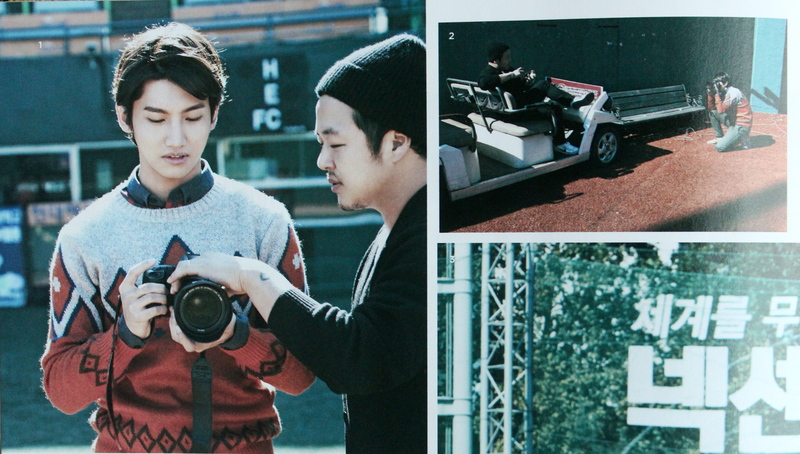 The calm and sophisticated photos Max Changmin took during his first project seem to reflect his emotions very well. It started like this. 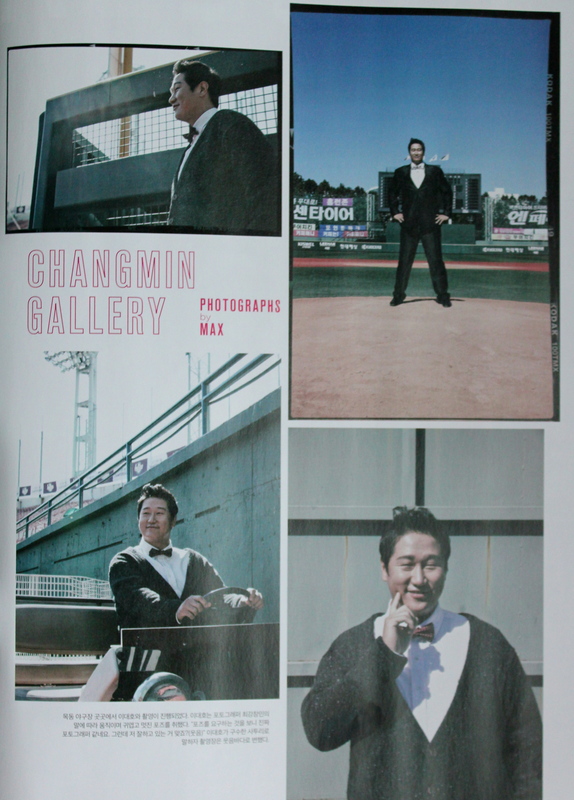 “Now that it’s been about three months since Changmin started learning about photography, I think it would be nice for him to choose a model and participate in a real photoshoot.” Thinking over Kim Young Joon’s proposal for a couple of days, Max Changmin surprisingly chose baseball player Lee Dae Ho as his first model. A baseball player and not a famous model or a friend? We were curious. We found out that he wanted his first model to be a baseball player because he loved the sport when he was younger. “When I was asked to choose a person that I liked and wanted to take photos of, Lee Dae Ho immediately came to my mind.” But it was a stretch to call Lee Dae Ho, who was training in Busan, to come all the way up to Seoul for a photoshoot. We relayed Max Changmin’s earnest and heartfelt request to Lee Dae Ho, and the baseball player moved around his busy schedule so that he could hop on a plane to Seoul. When the two stars met at the photoshoot, they quickly became friends and treated each other like old-time pals, and their laughter could be heard throughout the whole photoshoot. 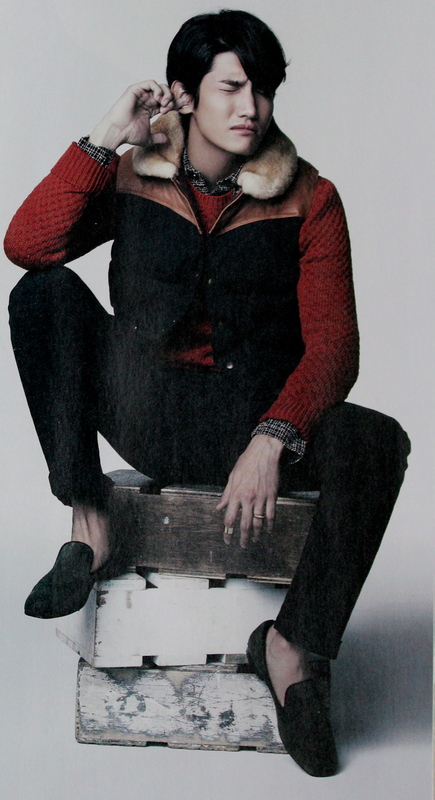 Thus, Max Changmin’s first photoshoot came to a successful conclusion. We are certain that the day will remain a precious memory for both Max Changmin and Lee Dae Ho. On the day that Max Changmin and Lee Dae Ho met, the baseball star was actually planning a family vacation. Since returning from his activities in Japan, he was give a short vacation to spend with his family. 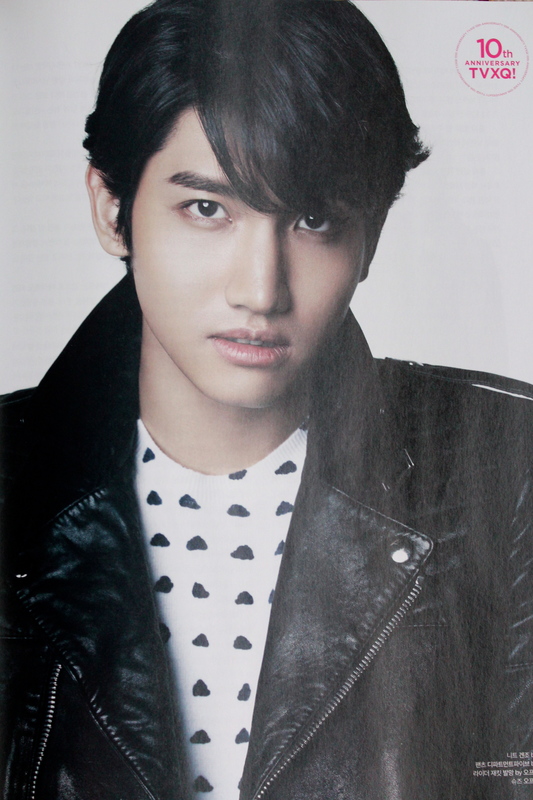 “When I first heard that TVXQ’s Max Changmin wanted to take photos of me, I thought they were joking. I had my manager confirm it a couple of times. I told my wife about it, and she told me to push back our family vacation and go to Seoul. That’s why I’m here. (laughter)” Like how Lee Dae Ho is a legendary baseball player to Max Changmin, Max Changmin is a great artiste in the eyes of Lee Dae Ho. His wife is a fan of TVXQ, so he’s heard a lot of their music and watched videos of their performances. Because of this, he naturally became a fan of TVXQ as well. It must have been for this reason that he was so nervous for his photoshoot with Max Changmin. “I’m not the kind of person who usually enjoys taking photos. I’m a baseball player, not a professional model. But when I heard that Max Changmin wanted to take photos of me, I told myself that I shouldn’t let this honorable opportunity go to waste.” Meeting with Max Changmin for the first time, Lee Dae Ho put all his passion and effort into becoming the perfect model. Though they only met for a short time, they two people formed a ‘connection’, and promised to see each other again as they hugged and said farewell. Lee Dae Ho’s photoshoot took place in a baseball field in Mokdong. Lee Dae Ho kept moving according to Photographer Max Changmin’s requests, and kept making cute and awe-inspiring poses. “Seeing him ask me to pose in certain ways makes him seem like a real photographer. I’m doing well, right? (laughter)” Lee Dae Ho’s strong dialect had everyone on set laughing and smiling. TVXQ have designed special lifestyle products that reflect their preferences. Come and see U-Know Yunho’s bracelet, which will be a highlight of his party, and Max Changmin’s custom sneakers, which will complete any and every outfit. U-Know: I want to make a memento for all the friends I’ve invited to my party. TC: What about a bracelet? You could even include it in the envelopes of your invitation. U-Know: I think I’d like to add more meaning to the bracelet by including some amethyst on the bracelet since that’s my birthstone. TC: I think it would be great if we applied the color of amethyst to the overall color scheme, into a design that is befitting of an end-of-the-year party. 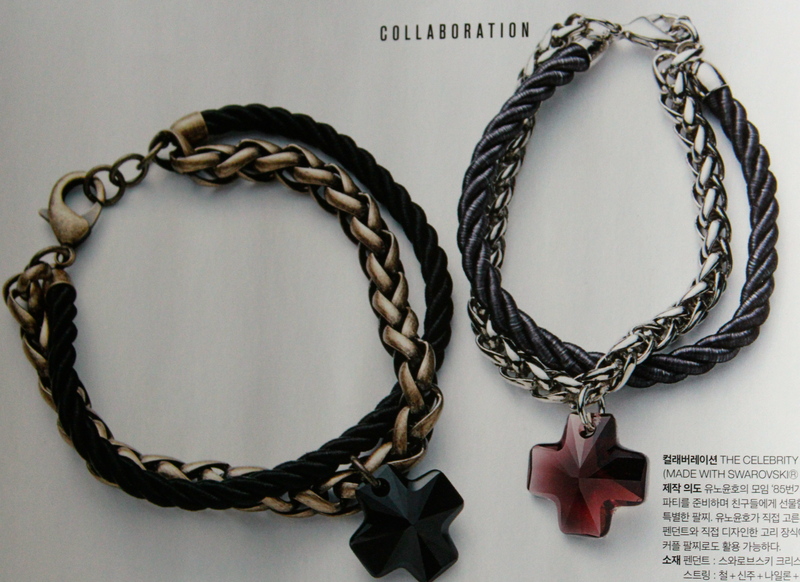 U-Know: If we include the link that I sketched out, it’ll remind my friends of me whenever they see the bracelet, right? 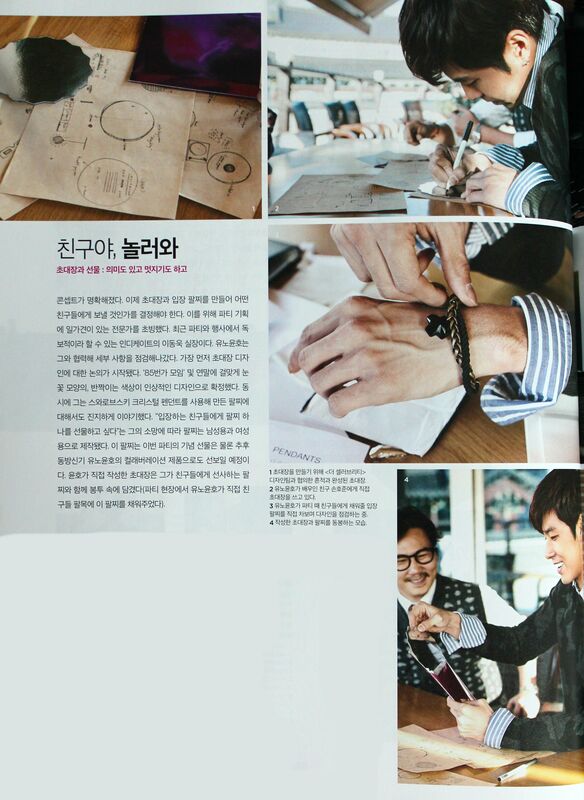 U-Know Yunho, who is extremely affectionate about his friends, wanted to create a meaningful accessory for them. It was his opinion that if he created a special, symbolic bracelet that reflects his preferences, it would be a precious item for those the person giving and receiving the gift. <The Celebrity> took his opinion and helped him create a special bracelet that incorporates the materials and crystals he chose, as well as an ornament he designed himself. The glittering gold chain and warm fabric come together in the strap, while the Swarovski crystals make it an accessory one could wear in everyday life or to a party. It should be remembered that it’s an accessory that couples can wear together as well. Purpose of Production While preparing his ’85st 10th anniversary commemoration’ party, U-Know Yunho expressed the desire to create a special bracelet to give as a gift to his friends. The crystal pendant was chosen by U-Know Yunho and the ornamental link was designed by the star. It can also be worn as an item for couples. MAX: Because I’ve been learning about photography, I’d like to create something that reflects that. TC: What about a product that has to do with cameras? Like a leather case or accessory. MAX: Hm, I’d rather make something that uses the photos I’ve taken. TC: Then what about a cushion or a photo frame? MAX: Wouldn’t it be more fun if we created a custom guitar or pair of sneakers that have the photos printed on them? Max Changmin is a sincere and thoughtful person. He is certain about what he likes and doesn’t like, and he was more interested in customizing than creating a new product. After throwing many ideas back and forth, it was decided that we would create a pair of sneakers with a pattern that came from the photos Max Changmin took. 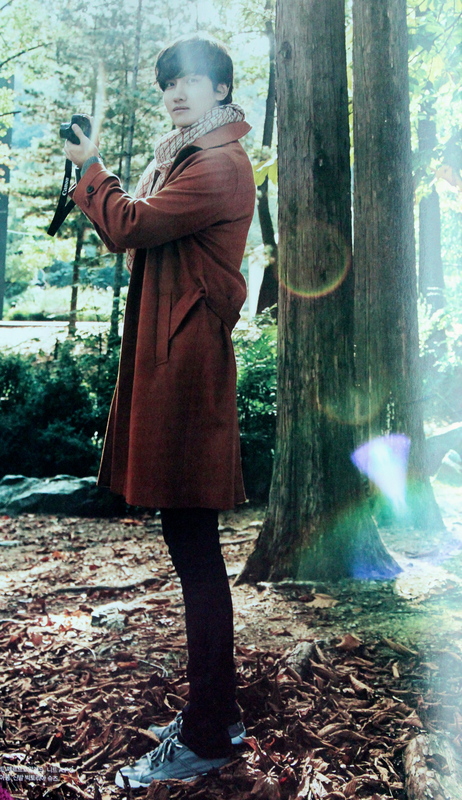 A flamboyant bird and wolf was chosen from the stack of photos he took at the Seoul Grand Park as his motifs. Only ten pairs of the amazing sneakers that reflect his photos will be available for sale, so they are a true limited edition item. The profits from selling the sneakers will be donated to provide children from impoverished conditions with the opportunity to take music classes. 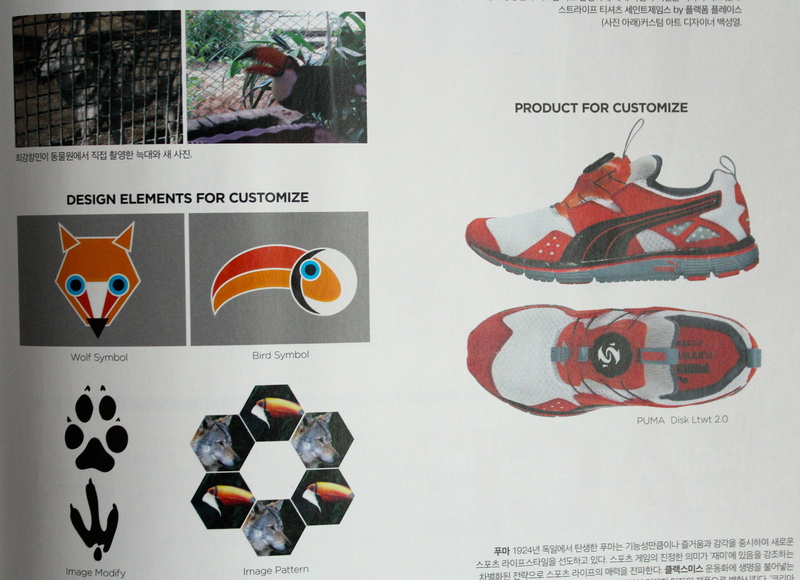 Purpose of Production Custom sneakers with a graphic pattern that reflects a couple of photos that Max Changmin took. By connecting his hobby with a product, he has created his own customized work. (Upper photo) Max Changmin is expressing his thoughts on how the customized art should look on his sneakers. (Lower photo) Baek Sung Ryeol, the custom art designer. Our photoshoot with TVXQ, the stars of <The Celebrity>’s second issue, was a large-scale production from the start. From U-Know Yunho’s party to Max Changmin’s photoshoot, we had to bring together experts in a variety of fields. 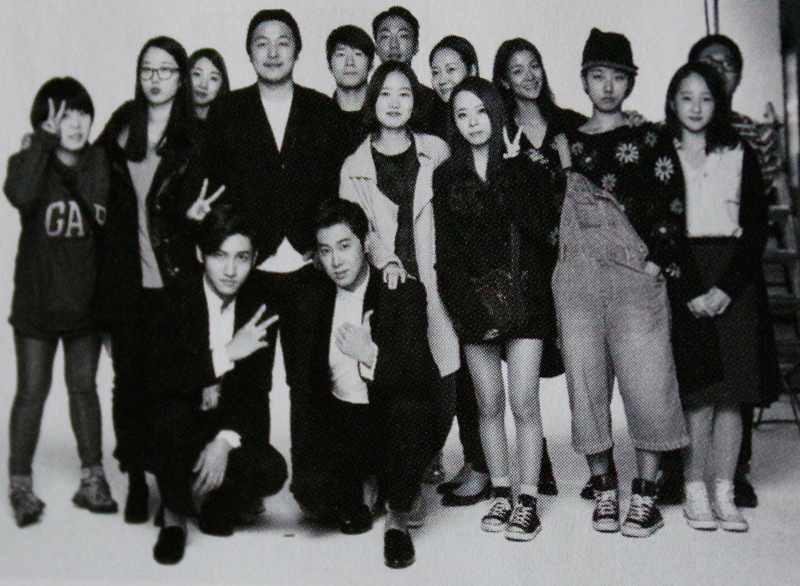 Max Changmin’s mentor Kim Young Joon was also in charge of the overall cover story photoshoot as well. An amazing second issue of <The Celebrity> was created thanks to the efforts of the fifty-member team of staff members and Stylist Seo Jung Eun’s team, who prepared outfits for over 30 people. A huge thank you to you all! 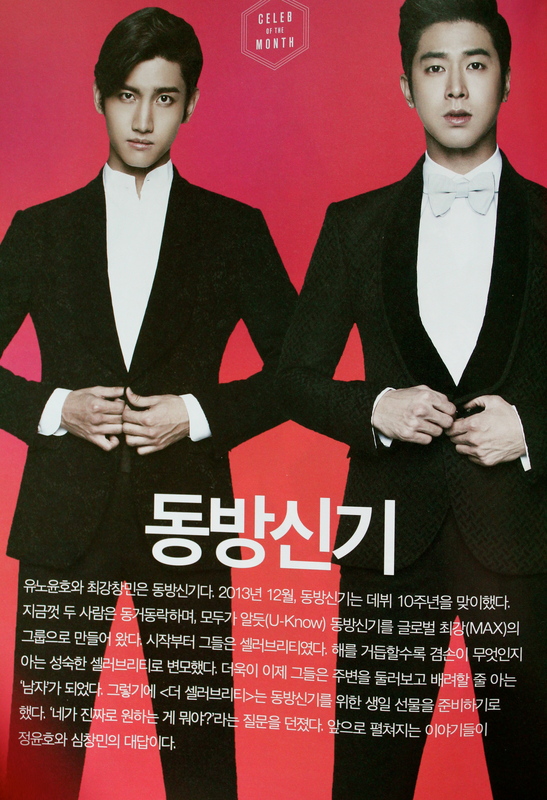 WOOOOOOOOOW, is the whole magazine only about TVXQ? :OOOO because in that case I definitely need to get this! I was waiting for your translations because i know you guys won’t disappoint and very accurate ..i enjoyed reading the whole content, it was much fun..so Thank you so much for the amazing translation really guys you’re amazing. This is a treasure, thank you so much^^ I was so confused with so many translations in other sites, these are good too, but your translations are more accurate to me. Despite I can’t buy the magazine (T^T) because people, who were selling it through their site, told me this good was sold out right now…so I’ll have resign myself. Anyway, thank you so much for your hard work, you have my respect. I love how you always work hard for us, I’m so glad you’re in this fandom. Thanks for you hard work!! very enjoyable read! thanks so much for the translations and photos ! What an incredible feature. Thank you for the hard work spent on this, and for writing such a lovely, clear and pleasant translation.